ESSA @ work - Local edition: 5-7 March, 2014. Germany. ESSA @ work - Conference edition: 1 September, 2014. Barcelona. Are you currently working on a social simulation project? Do you want to discuss your work in progress? Then you may want to attend the ESSA@work workshop during the Social Simulation 2014 conference (formerly: ESSA conference) in Barcelona. ESSA @ work invites all modellers to participate (PhD students, post-docs, professors). ESSA @ work is a workshop where any modeller can receive and give support on their and others’ simulation work in progress. Work in progress means that your work relates to questions and issues you have while in the design, building or validation & verification stages of modelling. This explicitly excludes finished projects. 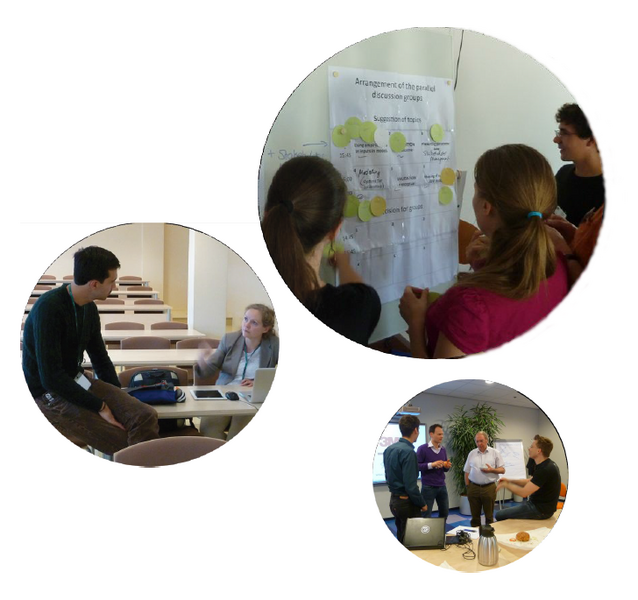 On the workshop day, modellers and experts discuss simulation projects guided by modellers’ current questions and form small, parallel discussion groups based on emerging topics. Questions and simulation projects can be diverse, but always related to current work in progress. Exemplary issues are: formalisation, gathering/use of empirical data, (design of) simulation experiments, using programming toolkits, validation & verification. The combination of highly involved people, cutting-edge research and a constructive atmosphere makes the meetings valuable for all participants. How to organise a local ESSA@work?